We, are our own worst enemy. Us photographers simply take too much kit. We’re wedded to that old axiom: “Better to have it and not need it, than need it and not have it.” Anyway, it’s not like we’re trekking with it, right? We’re just in a Land Cruiser rumbling around the savannah, so we can take everything, right? Wrong! This misguided wisdom leads us to travel half way round the planet with bags of kit we will never actually use or need. As I demonstrated in Part 1, too much choice clouds your judgement and lens selection takes too much time. Besides, there are some particularly prickly issues when it comes to travelling with all our valuable, precious, fragile camera gear: Weight restrictions flights; Security, Theft prevention; Protection against mishandling. Below, I’ll detail my experiences and best advice. In short, leave nothing to chance. Assumption truly is the Mother of all mistakes! Follow my advice from Part 1, regarding cutting-back on your lens selection and unnecessary paraphernalia. Trust me. This will go a long way to alleviating concerns regarding weight restrictions. In general terms, your weight limit for check-in baggage is 23-30kg and this will vary depending on the airline and the route – yes, the route, so do not assume to know the weight limit. Always check. You can usually take more than the standard limit, if you pay online in advanced. I strongly advise against this because of the rigorous and strictly enforced weight limit on internal flights – more on that later. The weight limit applies to each bag; it isn’t possible to split the total weight across multiple bags. For years, I’ve flown with British Airways almost exclusively and nearly always flown World Traveller Plus. I opt for World Traveller Plus, because it’s more comfortable with larger seats, more leg room, etc. Not all carriers have this ‘in between’ cabin, just Economy and Business. Whenever possible, I try to buy my tickets in the sale (although these are infrequent and ad hoc) and can sometimes bag the World Traveller Plus cabin ticket for the same price as standard economy. Although British Airways may appear more expensive, it’s a premium worth paying for. Besides, when I have used price comparison sites, searching for alternatives, tickets that seem cheaper often have additional costs applied, plus layovers and connecting flights. It’s a false economy. British Airways flies to every destination that I regularly visit, directly, without layover and connections. The one exception is Svalbard, where I fly SAS. Not only does BA have an extensive network, they command enormous resources when it comes to aircraft. For example, I was on a 747, expecting to push-off from the terminal, when we were told to leave the aircraft. Annoyingly, the cargo doors had been ‘accidentally damaged during freight loading’. BA managed to re-task a 747 in just 45 minutes. That’s impressive. I’m not insisting you fly BA. Just consider your choice carefully. It’s more than just the price of a ticket alone. Will your carrier be weighing your hand-baggage? Do they fly direct? Will you have to pay for hotel during a stop-over? If you have connecting flights, are they well-timed? What resources do they have, should your aircraft develop a fault, or if there is poor weather and the inbound service is massively delayed? If you miss your airline’s sale, there are still opportunities to buy a cheaper airline ticket. Check out this useful site from SkySkanner. With most airlines, there is a specific time period where they drop prices, before ramping-up closer to departure. For example, if you’re flying London to Nairobi, it’s cheaper to buy your tickets 7-9 weeks ahead of your intended departure date. Here’s another breakdown from Forbes, for my readers based in the U.S. If you’re like me, then you always check-in online, so you can avoid some of the queues and just drop your bags off at the check-in desk. However, before you confirm your check-in and seat allocation, have a quick look at SeatGuru. This is an excellent resource for frequent flyers and tells you which are the best seats on the aircraft for a ‘quiet flight’. SeatGuru can also tell you if your seats will have AC power for your Macbook/laptop. While you’re there, have a look at the Guru Tips. It’s full of useful travel tips! I know people who are literally stricken with panic when they arrive at the check-in desk. “What if I’m over-weight! ?” What if they want to weigh my hand-baggage! ?” “What if they insist on sending my camera gear to the hold! ?” Well, it pays to know the official guidance from your airline – another reason that I fly BA, because I know where I stand. I’ve never been asked to weigh my hand-baggage or place it in the baggage gauge – that metal tubular frame that you see near check-in. I put this down to the fact that my carry-on is always a backpack. Wheelies automatically draw the attention of ground staff – much more than a similar-sized backpack. I can’t comment on other carriers, but I definitely feel more assured of a hassle-free check-in with BA, especially when their own guidelines state 23kg for a cabin bag. I pass through security, plug-in my Bose QuietComfort headphones and it’s on to YO! Sushi to enjoy a tasty meal before boarding. Now, this is the really tricky bit… The light aircraft used to ferry us tourists to and from the Masai Mara and Serengeti are understandably smaller than a 747. Well, duh! The turbo-prop aircraft range from the Caravan to the Dash 8. Actually, my first internal flight from Lake Nakuru to the Masai Mara was in a Sesna! The Dash 8, which is most common aircraft for the Mara transfers these days, have very narrow overhead compartments and no leg room to store hand-baggage under the seat in front. The Caravans have no overhead compartment at all. Carry-on baggage is left at the back of the plane as you climb onboard. Option 3: Use a Tour Operator that transfers your check-in baggage via road, allowing you to fly with just your camera gear. Genius. If you are travelling with a group, your total baggage is weighed and divided amongst you. It doesn’t matter whether the person next in line is 100Kg+ and you’re only 65kg. It’s the baggage weight that counts. If the average baggage weight is above 15Kg per person, then you may have an issue. It can get messy, with people arguing over who brought the excess weight… It’s not a great to start to any trip. So, either pay for a freight seat or choose the Tour Operator wisely and ask for their advice on this issue, well before your departure. If your camera bag is a bulky backpack or wheelie, you will be asked to ‘check it’ into the hold. Don’t worry about it and, for goodness sake, do not get aggressive! The airline employees aren’t trying to make your life difficult and it is not personal. Being aggressive and stroppy gets you nowhere. They know that your bag simply won’t fit – that is all. The hold on these small planes is not a large space and the bags are handled with care, primarily because you can stand there and watch them load the bags. I’ve never had an issue checking my backpack into the hold for an internal flight, so please don’t be grumpy about it. It’s truly embarrassing, for everybody. For years, my go to backpack was the LowePro Vertex 300 AW (now discontinued). It was near the maximum dimensions for international carry-on and I could fit my 600mm VR f/4, 70-200mm VRII f/2.8, 16-35 VR f/4, plus two D800 bodies, with batteries and grips – all the essentials. The hood was packed separately. That’s still a lot of kit and basically all I need. On the rare occasion that I did need to check-in some kit, I packed my 600mm f/4, 16-35mm, and two bodies into a Lowepro Lens Trekker, the rest (either a 200-400 f/4 VR or 300mm f/2.8) into a Pelicase 1510, using extremely tight-fitting foam. I then place the padlocked Pelicase 1510 in a padlocked holdall or suitcase, to hide the fact that it’s a Pelicase – which SHOUTS “Expensive items inside! Please steal me!” In addition to the padlocks, you can also invest in a PacSafe bag protector – a metal mesh guard that wraps around your Pelicase to act as a deterrent. With my FujiFilm GFX50s mirrorless Medium Format system, sporting just two lenses, I now use the Tenba Solstice 20L Backpack. I really like this backpack with its slimline construction – so you don’t get caught on gates or turnstiles. It’s relatively narrow (compared to a very broad Vertex), with a generous front pocket for my iPad, batteries, and cards plus room for my Bose QuiteComfort headphones, sunglasses, and more in the top. 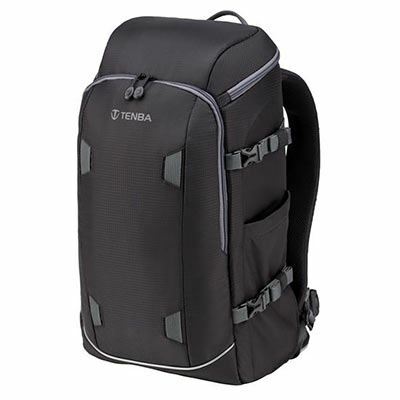 The main feature of the Tenba Solstice is the ‘through the back’ access, so you lay the waterproof front on the ground and access the camera compartment through the back of the Solstice, in between the shoulder straps. So many other backpacks have the traditional front access, meaning you have to lay the webbed back section on potentially muddy ground, then you have to wear this against your back. Yuk. Sadly, Nairobi’s Jomo Kenyatta International Airport has become a hunting ground for thieves, airside – meaning it’s the employees of the airport! Pelicases have been broken into, padlocks smashed, and camera gear stolen. The first thing you know about it is when your case appears on the carousel, with the locks broken. Thankfully, this has never happened to me, perhaps because of my ‘disguise’ tactic mentioned above. But, it has happened to clients and they are devastated, as you can well imagine. So my next recommendation is for good insurance, should the worst happen. My current insurer is PhotoShield (underwritten by Liverpool Victoria Insurance Company Limited) as they cover your equipment in the aircraft hold – as long as it is “securely contained in a Pelicase or similar case“. They also cover ‘new for old’ equipment, shipping-out hire or replacement kit. When I’m travelling for work, this ‘continuance’ cover is essential. I can claim and receive a new item within a couple of days, practically anywhere, thus insuring my commission or assignment continues with minimal interruption. Antarctica, might be an issue, but with international flights arriving into Nairobi and Kilimanjaro several times a day, and several internal flights to the Masai Mara and Serengeti, receiving replacement equipment is not a problem. It’s not your everyday travel insurance that covers you for continuance. So please do investigate specialist photographer insurance and see what cover you can get. In short, however, DO NOT check-in your camera gear into the hold, if you can possibly avoid it. For a really thorough look at the essential camera gear – read my special guide here. This might come off as a bit of a rant, but stay with it… I’m a selective photographer and always have been. I cannot understand this ‘machine gunner’ approach to wildlife photography. Hundreds of frames fired on a puffin that is standing stock still. Same with a lion that’s just lying around. It boggles the mind. It’s the metaphorical equivalent to throwing mud at the wall and hoping something sticks. If you shoot 100 frames in one moment and a single frame is ‘the shot’, can anybody really say they’ve “Nailed it”? Who is going to want to edit hundreds of practically identical images? Do you want to grow and improve as a photographer, or just get a high enough hit rate to put something on social media? I recently used the Nikon D500 Digital SLR. For a camera under the GBP£2,000 mark, It’s an impressive piece of kit. It shoots an incredible 10fps on a 20MP sensor. For me, personally, 10FPS is just ridiculous. It’s not that I’m old-fashioned (feel free to comment…), it’s the workload. Even shooting selectively, pulsing the shutter, I have so many ‘similars’, from this camera, the process of editing through them all is just a pain in the arse and a waste of my valuable time. I do understand the attraction to high FPS cameras. Sincerely, I do. If this is your once in a lifetime trip, you want to make sure you go home with some shots. If you’re a press photographer, streaming JPEGs across the digital ether, directly to a picture desk, you’d want to be sure you captured ‘the moment’. I get it. However, if you really watch nature and the animals – and I mean really watch them – you’ll be able to interpret the behaviour and anticipate the moment, timing your shots far better than if your eye is permanently attached to the viewfinder, your finger glued to the shutter release. Perhaps, this is where the true value in a skilled Photographic Tour Leader is found. Experienced professional wildlife photographers can articulate the “how, what, and why” as they are photographing the subject, so you can key-in to their experience. “It takes no skill whatsoever to press a shutter button. If you have a high FPS camera, why not consider pulsing your shots? Rather than leaving your finger down on the shutter? Pulse the shutter button, so you are shooting in 2s and 3s, rather than in batches of 20s and 50s. At least then, you’ll be able to glance around, and see what’s going on. You never know, you might see a situation develop, anticipate the outcome, and genuinely nail that shot with just 2 or 3 frames. Rant over. I always recommend at least two camera bodies – one for a telephoto lens plus another as a grab camera with either a mid-zoom or a wide-angle lens. Having a second body means that you can grab fleeting landscapes and contextual images, without the need for swapping lenses. Ideally, your camera bodies should be the same make and model, so there is no mental struggle (and time-wasting) as you decide which body you’d rather shoot with. In the past, I have had two different DSLRs. I would struggle to decide which I would prefer to shoot with – usually favouring the bigger, better, cleaner sensor. The deliberation cost me opportunities as I was busy pondering, or then rushing to shoot the encounter. Realising my mistake, I decided to upgrade in pairs, purchasing two bodies at a time – the same make and model, with a 3rd older/lesser body for backup. This started with a pair of Nikon D3s, then a pair of Nikon D800 (subsequently replaced by the outstanding Nikon D850). With two matching bodies, my decisions simply came down to lens choice – close-up and into the action with a 600mm, or capture the context with the short-zoom or wide-angle. The decision was a snap. With my current medium format setup, I now shoot with two bodies, but each system is specific to a particular style. The medium format is my wide-angle and context system, whereas any hired DSLR and 400mm combo is my detail, action and portrait system. Whichever avenue you choose, shooting two bodies side-by-side, will not only minimise reaction time, but also prevent wear and tear on the lens contacts (because you’re not swapping lenses every five minutes) and protect the sensor from unnecessary exposure to dust. If you’re not experienced, exacting, and decisive, opt for a pair of matching DSLRs, even if you have to hire one. Ever considered making a photo diary on your safari? It’s great for social media, plus it adds some candid material – behind the scenes shots – that can often prove just as interesting as your slideshow/portfolio of beautiful animal images. I used to carry a Canon PowerShot G10 with me, but now I just use my iPhone for candid shots within the vehicle and video snippets of my encounters. Prior to my recent system change, there was always a super-wide zoom like a 16-35mm, mid-telephoto 70-200mm f/2.8 zoom, and 600mm f/4 prime. Along with the camera bodies, this was my standard safari/travel kit and it went with me everywhere. As long as you have a wide-angle and a zoom/telephoto, you’re in business. Don’t have a good quality telephoto? Hire one from Lenses For Hire or Fixation. For landscapes with huge skies and for those moments where the animals approach really close to the vehicle. Also great for turning the camera inwards into the vehicle and catching those behind-the-scene shots. It’s easy to get carried away with the telephoto – shooting frame-filling portraits – but remember to photograph the animals in their environment. A portrait rarely says nothing about the animal’s habitat. The 24-70mm (used above) or 24-105mm is a good range for ‘animals in their environment’. We’ll discuss this more later. Gives you the flexibility to photograph herds, packs, prides, and landscape details. Good examples are the classic silhouette of an animals on the horizon with rays of light through a thunderstorm. The 70mm end is also great for panoramic ‘stitching’, so you can build a panoramic vista, whilst maintaining a closer perspective. The 200mm end is great for panning running herds, especially with the addition of a screw in ND filter to slow the shutter. To get you into the action, for portraits, frame-fillers, and bird life. For years, I’ve used a 600mm f/4. It’s a gorgeous lens, but usually way too much glass for most situations. Big cats and herd animals are often too close for anything other than abstracts, although I do enjoy that challenge. The sheer physical length of the 600mm f/4 (with its bucket-sized lens hood) makes it rather unwieldy, especially within the confines of a safari vehicle. The 400mm f/2.8 would now be my ‘go to’ lens to hire for a safari. Remember, telephotos also make great landscape lenses. You will see features in the landscape and animals walking along ridges. At a distance, they photograph exceptionally well as isolated compositions. Note: You do have to be careful when shooting distant animals during the heat of the day. They will often blur or appear smudgy because of the heat shimmer. 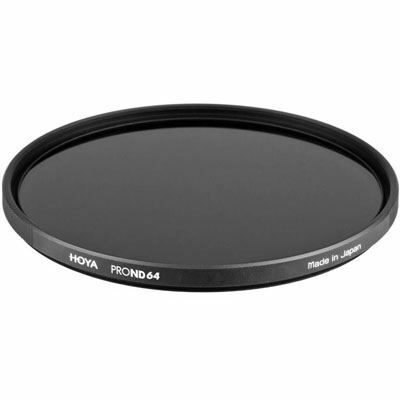 The Hoya 77mm Pro ND 64 Filter reduces the amount of light entering the lens by up to 6+ stops, without affecting the colour balance. I only recommend two types of filter – a circular polariser and ND filters. Polarising filters reduce glare and saturate colours, as well as deepening blue skies. The downside to using a polariser is that you lose 2-stops of light, slowing your shutter speed. Graduated neutral density filters help to correctly expose bright skies and preserve exposure for the ground/foreground. The typical setup is with using square 100mm filters in a slot-in holder by Cokin (cheap and good) or Lee Filters (expensive but arguably the best). Screw-in ‘solid’ or non-grad ND filters are a great option when you want to slow the shutter speed to capture motion blur. Without an ND filter, you would need to drop your ISO to its expanded minimum (L.03) and close the aperture right down to f/22. This will reveal every speck of dust on your sensor – a nightmare to clean off in post-processing. A 6-stop ND filter is just sheer enough to see through and compose your photograph, while dropping the shutter speed 6-stops. An exposure of 1/60th sec becomes 1 second. A 10-stop ND is basically opaque and not practical. These screw-in filters come in a range of densities and sizes to suit the lens’ filter thread. They work especially well with the 70-200mm f/2.8. There’s a useful buying guide to ND filters on TechRadar. The double-beanbag is a great accessory and my go-to ‘support’. Take one (preferably more) flat-packed in your luggage and ask the camp/lodge to fill it with beans or rice. Do not travel with a filled beanbag! The larger molar-type beanbags offer-up enough support for even the largest lenses and can be left in position, on the car door, all day. Some of the better camps and photographic safari tours will even provide beanbags for you – obviously check before flying out. My only (small) issue with the trusty beanbag is when it comes to panning – rotating the camera to track a moving subject. The material gets caught-up on the lens foot and the lens-barrel rolls over, producing skewed horizons. There’s a cheap fix for this in the form of a ‘panning plate’ which screws into the lens foot and a metal base plate. The whole rig then sits on the beanbag. The panning plate enables a smooth rotational movement. You could also invest in one of these £100+ LensCoat beanbags, with removable mounting plate. The plate features a 3/8”-16 mounting screw, allowing the attachment a gimbal or the panning plate mentioned above. Alternatively, you can do what I do… learn to pan smoothly handheld. It requires no gear, just practice! If you already have a decent molar beanbag, but want something to improve your panning, then have a look at the Skimmer Ground Pod or the Visual Echoes panning plate. Both accessories can be placed on top of the beanbag and allow free range of lateral movement. An alternative to the beanbag is the Manfrotto 035 Super Clamp. It’ll bolt on to almost anything. With one or two in place, you can screw-on your favourite panning head and leave it in position. For less than £20, you have a solid, mobile tripod-head. With its large lever, you can detach it and move it around the vehicle. They sound good, but the significant downside is that they are slow to move. I would always use them with beanbags that can just be thrown about. Tripods are not advisable, especially if you are sharing the vehicle. The only exception here is with the open-style safari vehicles that have no window-sill or roof on which to place beanbags – and even then only if you have exclusive use of the vehicle. These open vehicles are much more common in the southern African nations. In these vehicles you will need a tripod or monopod clamped to the seat in front. By all means take a tripod for landscapes or time-lapse when you’re allowed out of the vehicle. Monopods can be very useful as some safari vehicles don’t have suitable window heights. This is something for you to ascertain by contacting the tour operator or the camp/lodge directly. If you physically suffer with your back or restricted in your range of motion, the monopod is more comfortable. I invested in the Gitzo Carbon Monopod Series 4 6S with a maximum height of 154cm and a maximum load capacity of 30kg. This monopod packs small with a minimum length of 44cm, nice and light (670g), strong, with a large stabilising foot. The main constraint for any camera support is weight and tripods simply weigh too much. Remember your 15Kg limit! This is why empty beanbags just win hands down.